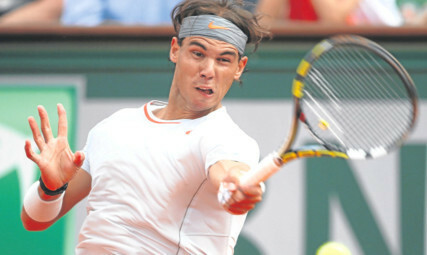 I don’t think enough emphasis has been put on Rafa Nadal’s performance in winning the French Open. People outside the game don’t appreciate how hard it is to get back into the pace of things after an injury break. They just saw Rafa was back in action and automatically made him favourite for the French. Believe me, nobody in the game thought that. To miss seven months is huge. Some players never catch up after losing that amount of time. Nadal slotted straight back in. He has lost only two of 45 matches this year. That is sensational. Whatever happens at Wimbledon, or the US Open, the Spaniard is my player of the year. However, on the grass at Wimbledon, Rafa’s big weapon, the forehand, does not have quite the same impact as on the clay. It doesn’t get up so high, forcing players into uncomfortable shots. I know Nadal has won Wimbledon twice in the past. I was one of the ‘experts’ who said he’d never win a Major on grass, but the Spaniard has adapted his game well to cope with Wimbledon’s unique demands. I just feel that Novak Djokovic is No 1 on every surface other than clay. The margins are minute, but that’s the difference between winning and losing at top level. There’s no doubt in my mind that Djokovic, Nadal, Federer and to a slightly lesser extent, Andy Murray, have taken tennis to a whole new level in recent years. They keep raising the bar as happened in that Paris semi-final. Having said that, I’m not yet convinced that this is the greatest era of the game. Technology and fitness have come on in leaps and bounds. The players of today can hit winners at full stretch from anywhere on the court due to the advances in racket technology. I believe that the era of Bjorn Borg, John McEnroe, Jimmy Connors, Guillermo Vilas and Ivan Lendl was pretty special. If they’d had today’s equipment and training regimes, their tennis would have been spectacular. However, the current top four are getting pretty close! I can’t wait for the second week of Wimbledon. There could be some incredible tennis.